I had some decent luck early last week. On Monday I stopped at this pile and met a lady who was clearing out her son’s apartment. She told me he had moved up north. Why he didn’t deal with his own stuff, I don’t know but maybe he just ran out of time. She seemed nice and offered me a few things but the best stuff was in the bags. One of them held a bunch of jewelry, some of which was silver. 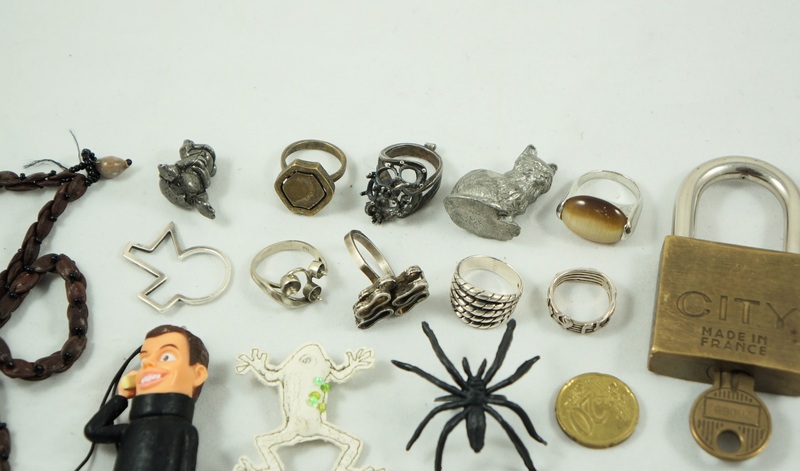 The rings were the most interesting pieces from that lot. The bottom row are all silver, except the one second from the left which is stamped 10k gold. The top middle ring might be silver too, but I haven’t tested it to confirm. A couple of the rings look incomplete. The top middle one for instance has prongs for stones, but they aren’t bent as you’d expect to see if they were removed afterwards. There’s also a bit of extra material on the back that wasn’t filed off. The ring marked 10k gold may be finished, but is missing its decorations (perhaps pearls?). I like the ring at bottom middle, it has a sort of mid-century look. It’s not stamped but my acid test confirmed that it’s silver. The ring (or at least I think it’s a ring) on the bottom left is also kind of cool. It’s marked sterling and is signed, but unfortunately as with most signatures it’s largely incomprehensible. I have no idea how to describe the style, so if you have any keyword ideas let me know in the comments! Here’s some more jewelry. This stuff is mostly yard sale material except for that thing on the bottom. I thought it looked special, so I posted some pictures on Reddit to see if anyone could help me identify it. There weren’t many guesses, but one person somehow found a link to a very similar “Rajasthan 19th c Anklet” on an antiques website. I don’t know how the seller came to that conclusion, but so far that link is the only information I have to work with. Regardless, the listed price is 120 British pounds (roughly 200 Canadian dollars) and I’ll be happy if that number is even vaguely realistic. Here’s some more junk from that spot. I haven’t had to buy soap for a long time because people keep throwing it out! 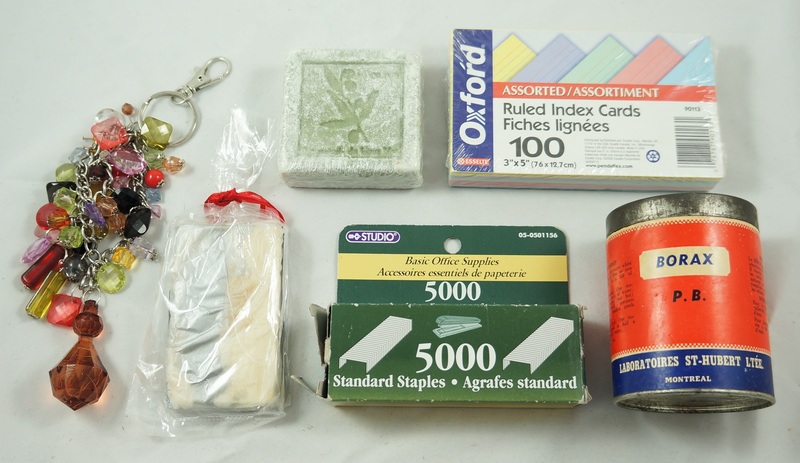 I always like finding vintage tins like the Borax on the right. 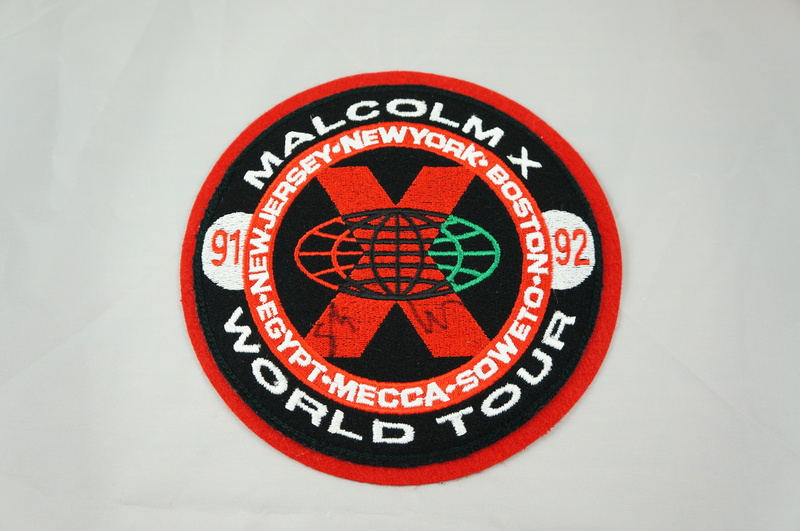 I also found this large 8″ “Malcolm X World Tour” patch that was made for the 1992 Spike Lee movie. It looks to have been signed on the X, by who I have no idea. If you have any guesses let me know! This should be something I can sell for a modest price on eBay. On Tuesday I found some miscellaneous stuff in Park Ex and Villeray. 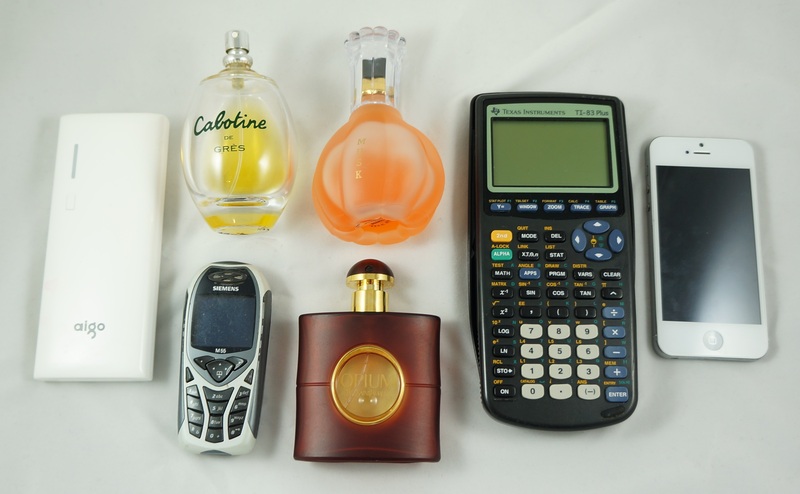 The best find might be the TI-83+ calculator, which should be good for around 30-40$ though I haven’t tested it yet. The “vintage” phone is going into my electronics recycling pile. The YSL Opium is a decent find too, it’s only around 40% full but a new one costs 95$. I was excited when I found the iPhone but it turned out to be a fake. It was modeled to look like a iPhone 5s (the phone I’m currently using), and while the phone looks good at first glance it doesn’t take long to realize that it’s junk. The fake is on the bottom in this picture – you can see how the buttons don’t fit very well, and how the material is a cheaper plastic that’s already starting to crack. Anyways, the phone doesn’t turn on and isn’t worth fixing, but at least now it’ll get properly recycled. This is the first time I’ve found a fake iPhone. Otherwise, my spot in the Mile End continued to produce. I found some more sewing stuff, most of which wasn’t particularly exciting. 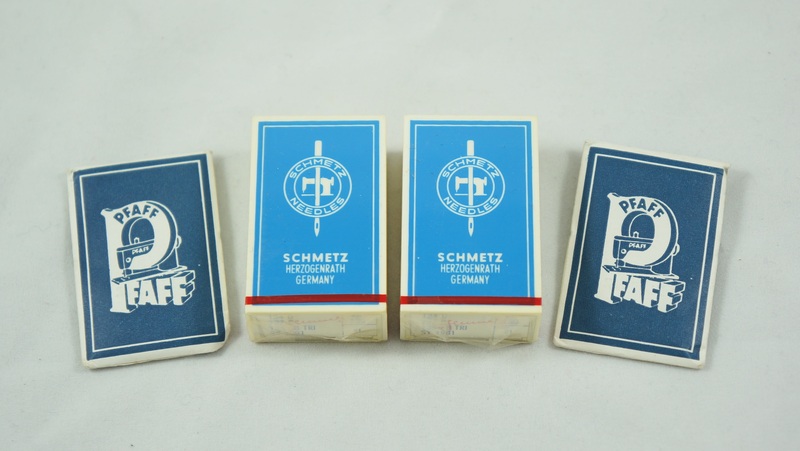 However, these two unopened boxes of 100 Schmetz needles were a nice get. Similar boxes sell for between 25 and 95$ each. The price seems to depend a lot on these numbers but I have no idea how to read them. If anyone can help me figure out what they mean I’d appreciate it! 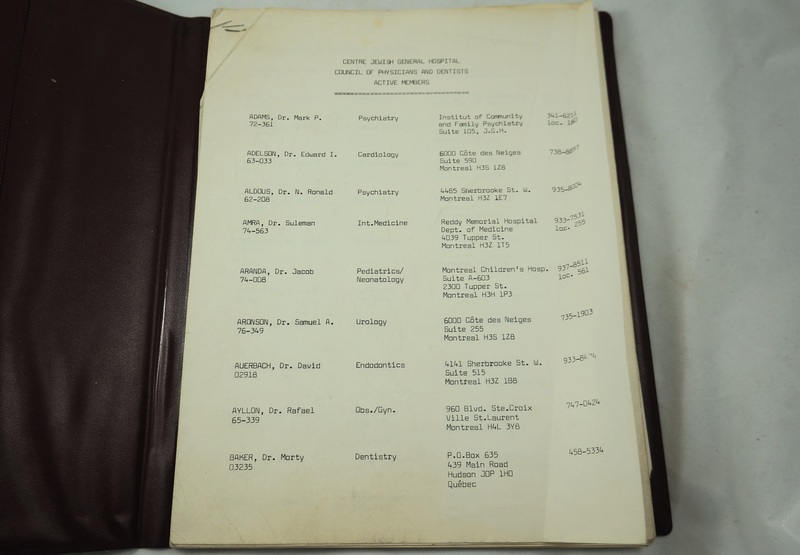 One pretty random find was a folder containing a list of doctors who practiced at the Jewish General Hospital. I’d guess this was typed up in the 1960s. I do well with vintage calculators. 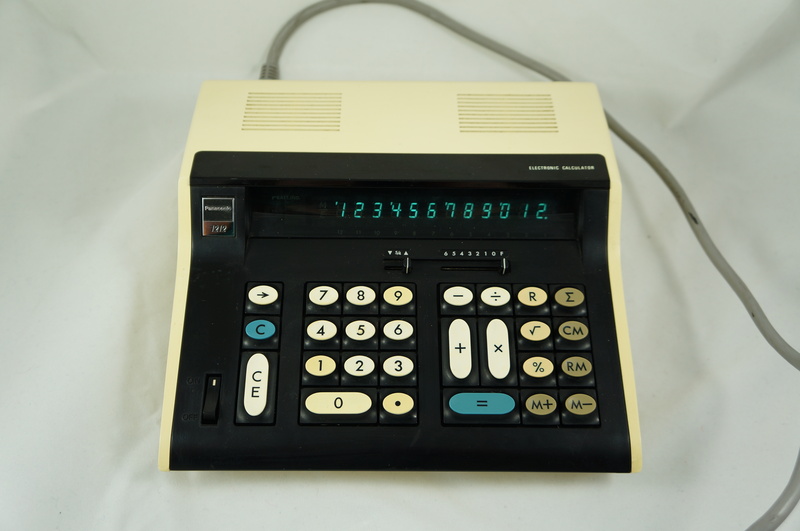 This 1970s Panasonic 1212 doesn’t work perfectly (divide and subtract seem to be glitchy) but I expect it’ll sell for around 100$ regardless. It’s in nice cosmetic condition, especially after I wiped it down with a microfibre cloth. In one bag was a smaller shopping bag filled with miniature furniture. 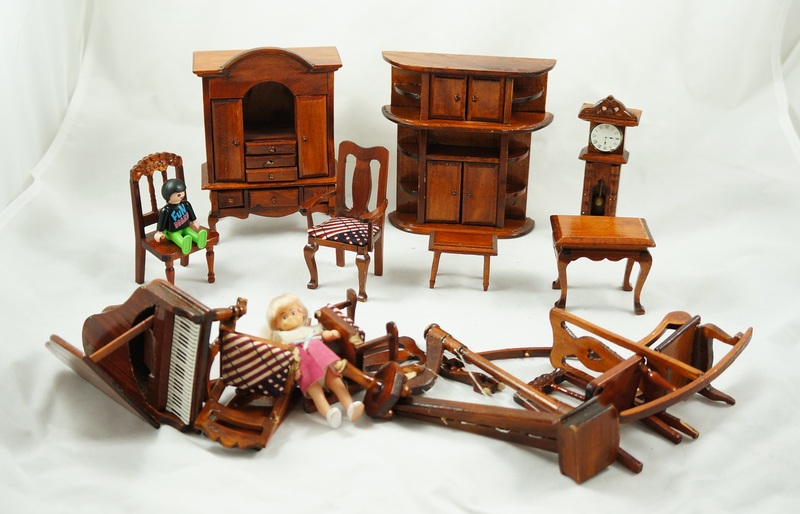 I would guess these were part of a dollhouse kit. Some were broken but most of those could be easily fixed. I might keep a couple pieces for my collection, I think they’re pretty cute. 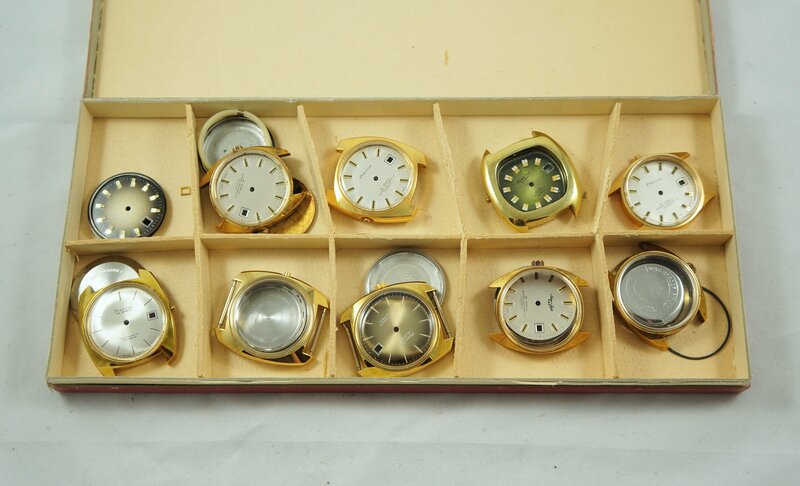 My favourite find though was probably this box of watches. There are no mechanisms, just cases. Most of the watches are branded Precisa. The company is not well known, but they made some decent looking watches back in the day. 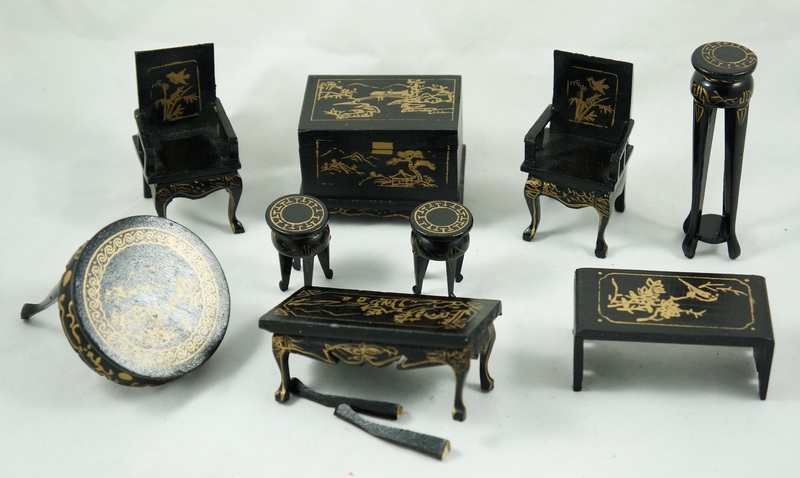 A few of the cases are marked “plaque” or gold plate. All have a very mid-century look to them. I haven’t really done much research into their value but I’m sure someone will have interest! I didn’t get much picking done later in the week. There was a big snowstorm on Tuesday night, so I skipped my Wednesday and most of my Thursday run. It’s just too annoying to get around when there’s so much snow. On Friday I had my root canal, so I didn’t get anything done then either. Oh well! The beginning of this week was a bit slow, so hopefully I come across some good stuff on Thursday and Friday to make up for it. I just googled “spike lee autograph” and the way he writes his “S” to start his name – looks like the “S” on the patch you have. Could be signed by Spike Lee – that’s my guess. Either way signatures can be annoying to deal with. They are a pain to authenticate, and in most cases the actual signature doesn’t add enough value to be worth the effort. I might try the auction route, and let the market decide whether they think it’s his signature or not. We’ll see if anyone else has some thoughts on the matter. You’ve got some nice finds there! I think the “knobs” on those rings are part of the design, and not prongs for stones. I had something quite similar incorporated in my wedding ring (which was made by a jewellery maker in CDN in 1972). I agree. 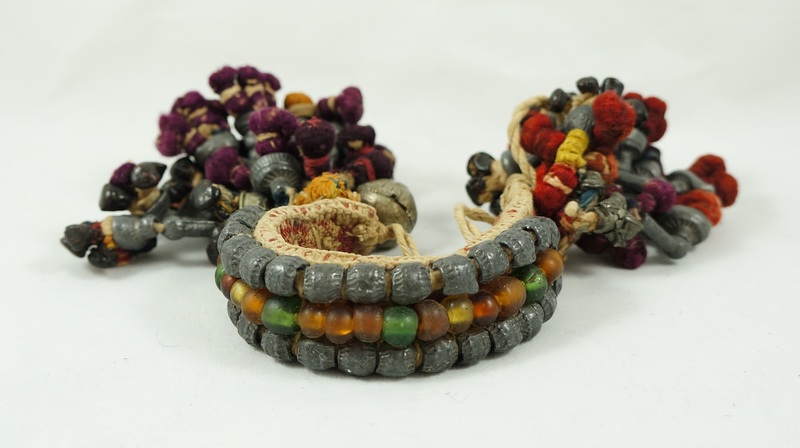 I think you’ve found yourself a Rajasthan 19th c Anklet. The bones on the necklace are actually vertebrae. Not sure of which mammal, though. I have been “doing garbage” for over 6 years now. I started in Montreal, my native city and continued doing it when I moved to the GTA 5 years ago. My bf and I are now in the middle of cleaning up and painting a barn, the location of our new vintage and thrift store. 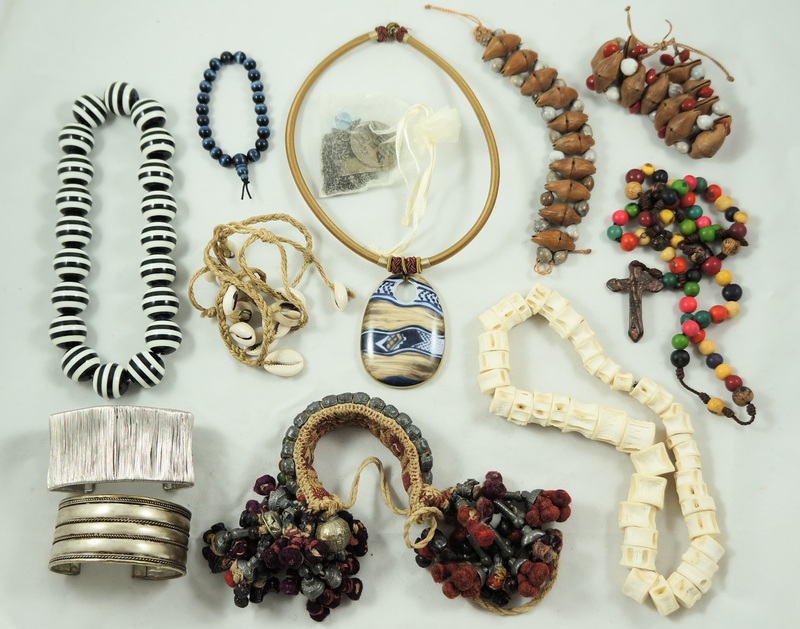 We will be selling all of our garbage finds in our 2000 sq. Ft. barn. There is practically no overhead since we are living in a house right next to the barn. 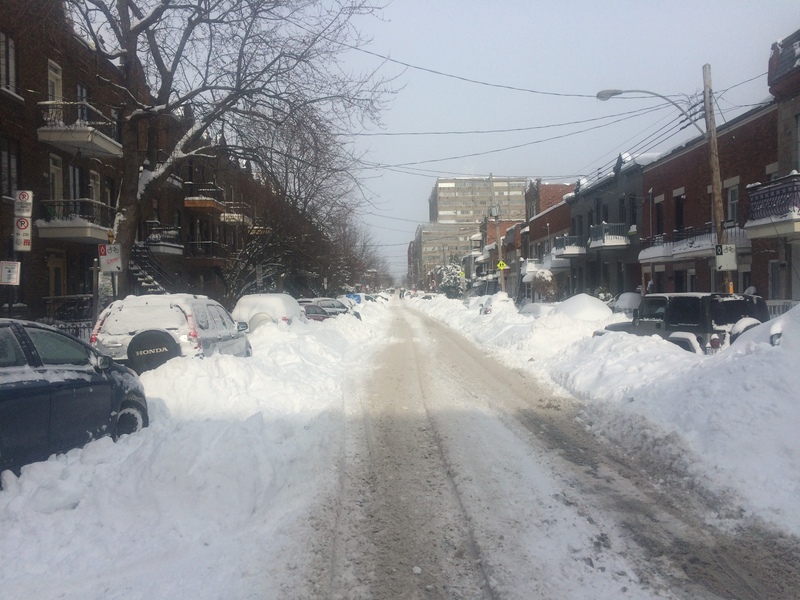 Being a native Montrealer, it’s been interesting to read your blog about what you are finding in that city, a city that I know like the back of my hand. We are very excited for the barn store since it’s situated on 13 acres on a very well traveled country road with a huge parking lot next to it! The amount of merchandise we have picked upin 6 years is huge and it includes silver, gold, diamonds, collectibles, and tons of other stuff! Sounds cool! I’d like to see it. I fantasize about having a store sometimes but the rents here are pretty prohibitively expensive here. I’d have to team up with a friend or something. Anyways, glad to hear things are going well in the GTA. I bet there’s some good trash out there, maybe even better than here. Are those cuff bracelets (bottom left, 3rd pic) silver? They look it. They quite nice. I think the bottom one is covered in a layer of silver, the other one isn’t though. The number on the needles indicate a large needle for heavy fabric. Could be for an industrial machine. Hmmm, thanks! I think the bigger ones are more valuable maybe. Think this looks almost identical to yours. Thanks, I didn’t see that. I decided to list mine at auction, sometimes it’s easier just to let the market figure out the value (though I prefer BIN more often than not). Sorry about that snowstorm, but it looks like you found some really, really neat things this week! 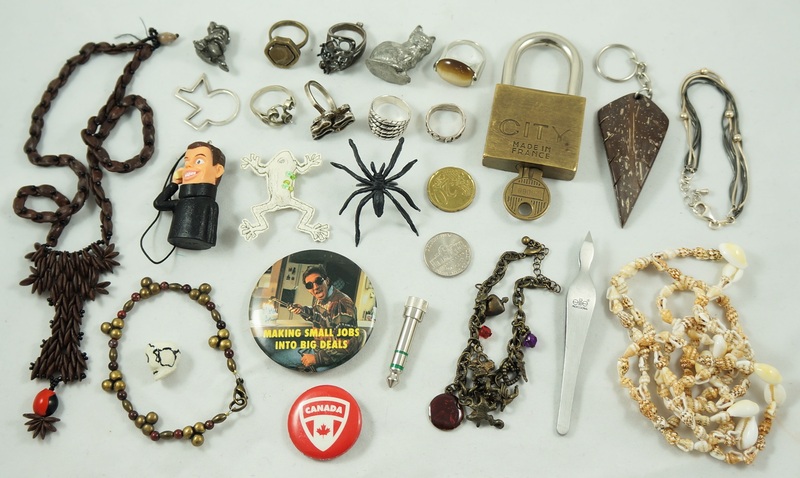 What a haul on that bag of jewelry. 🙂 How much do you think you save on household items by using things you’ve picked? There’s also the larger items, like furniture or that espresso maker I use every day. It’s hard to put on a value on those, because to some degree they are vanity objects I wouldn’t have bought (I don’t need a nice coffee maker, for instance) but regardless they do serve a valuable function, and make it so that I don’t have to buy anything like it. That’s not even include dumpster diving for food, which has saved me lots of money over the years. So, yeah I have no idea how that adds up. But it’s certainly a notable amount. 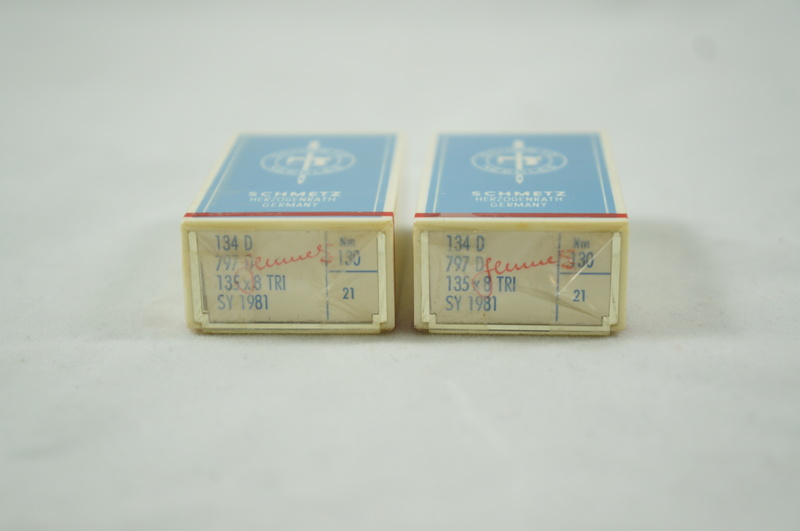 …adding to Carolyn’s reply – needles for an industrial sewing machine are sold in boxes of 100. The needle system numbers (134D, 797D, 135x8TRI, SY1981) define the dimensions of a needle to suit the type of industrial sewing machine. The needles are “cutting point needles,” with sharp tips that are like blades. They come in different shapes to pierce fabric more readily, generating less needle heat – yours are triangular (TRI). The NM or needle number is for needle size/thickness. “130” (European metric system) means 1.3mm in diameter measured just above the eye. “21” is the Americal system equivalent. I enjoy your blog very much! Thanks! Lots of good information here. Shows how little I know about sewing. Hope the root canal went well. Good to have it over with! It’s over, was really easy too. I stressed out way too much about that one. Bone necklace probably shark vertebrae…vintage surfer style jewelry. Very nice. Hmm, thanks. I’ll look into that a bit more. Hi,there are four luxury condo buildings at the intersection of Vinet Street and Ste.Cunegonde street near Atwater market.There are outside those four buildings about 25 to 35 big green plastic recycling bins with lids on top put out on Wednesday morning between 8 and 10 am for curbside trash pickup.Inside there are often vases,vinyl records,books and a variety of other useful or interesting treasures.Please look inside all of them if you are in that area on Wednesday morning and rescue the useful stuff. Cool, I’ll check it out if I’m in the area though I’m not there too often (driving there during the day isn’t particularly fun, especially with all the roadwork going on downtown).